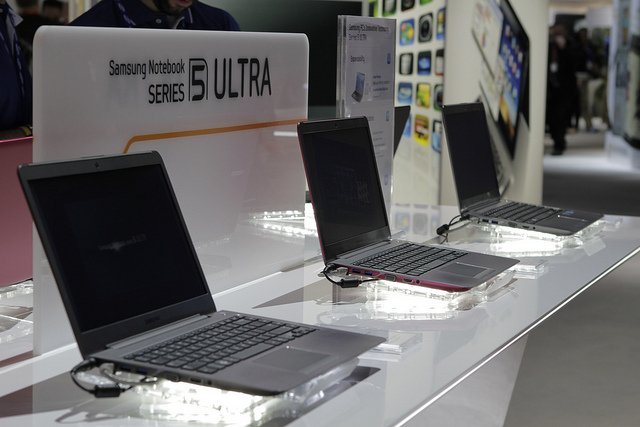 Samsung Electronics has recently launched its new range of Series 5 Ultra notebooks. The new Samsung Series Ultrabooks are slim and provided with unique features and an Intel Core i5 processor. The Series 5 Ultrabooks are released in 13” and 14” screen size. The 14” model is one of its kind in the market, which has a built-in DVD drive and SD card slot. This provides users the comfort of easy access to software, movies, photos and more. The Series 5’s storage capacity also provides an added advantage to the models along with strong storage capacity on cloud. The 14’’ model has 1TB of storage capacity and the 13” model can store data upto 500 GB. This ensures that a user can rely on these devices without carrying any additional storage devices with him. The battery life of the series is also well extended up providing 6.4 hours of battery life on a single charge. The The Samsung Battery Life Plus, an innovative anti-aging battery technology that retains about 80 percent of the cell’s original capacity for about 1,500 charging cycles extending upto three years. This way battery of these devices can live longer than other notebooks. They have boot up time of 20 seconds and wake up time of about two seconds. In design, the Series 5 Ultra showcases sleek lines and a cool, sophisticated design. , The 13” variant is just 14.9~17.6mm thin and 1.42kg light (w/SSD). It features the Intel® Core™ i5 processor with 8GB memory, up to 500GB storage and 16GB iSSD with ExpressCache™. Consumers can also opt from a 128GB SSD or 258GB SSD as their preferred storage. The 13” model also has a full-size HDMI port along with one USB 3.0, two USB 2.0, 4-in-1 multi SD card slot, Ethernet and webcam. Whereas the 14” model has in-built Intel® Core™ i5 processor and has 8GB memory and 16GB iSSD with ExpressCache™ system providing exceptional performance. For larger storage and heightened visual experience, it has 1TB storage as well as an AMD Radeon™ HD7550M 1GB graphics card. An integrated Optical Disc Drive also presents ease of the maximum convenience. For connectivity, the 14” model provides full-size HDMI, VGA, two USB 3.0, one USB 2.0, 4-in-1 multi SD card slot, Ethernet and webcam. The retail price of the 13” and 14” Ultrabook models are Rs. 48,990/- and Rs. 54,390/-model wise.